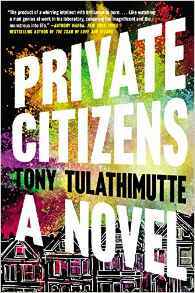 Tony Tulathimutte is the author of the new novel Private Citizens. 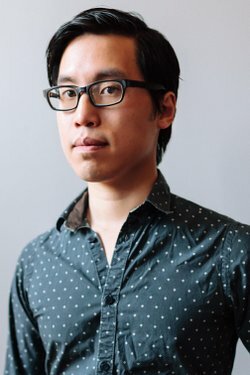 His work has appeared in a variety of publications, including VICE, The New Yorker, and The Atlantic. He is based in New York. Q: In an article in The Atlantic, you wrote that your characters were "1.) exactly as smart as me, 2.) about as privileged, and 3.) freely awful." How did you come up with these particular four main characters? A: In that Atlantic article I talked about how important it was for me to stop writing the kind of hard-luck characters that made my readers think I was a sensitive, empathetic writer who really understood what was going on with people glaringly different from me. In other words, I started off by writing four characters that were in various ways similar to me, yet with the kind of fictional distance I need to write with any kind of perspective. But my relationship to the characters became a pretty distant concern as they ended up coming into their own and playing off one another. I wanted four characters who’d be good foils for each other no matter how you paired them off; I also wanted characters who’d be naturally immersed in the subcultures and ideas I was interested in at the time—Silicon Valley and technology, the nonprofit sector and progressive politics, writing and literature, higher ed and science. Q: In the novel, you write from the perspectives of various characters--was there one whose perspective you particularly enjoyed? A: Writing Linda was hugely freeing for me. She was the first character I came up with, and her precocity, libertinism, and unabashed intellectualism let her get away with things that other characters simply wouldn’t be able to—on the one hand, thinking explicitly about literature and fictional tropes, and on the other, shoplifting, drugs, casual cruelty. She’s the only one clever enough to be self-aware as a fictional character, and actively pushing back against me as I was writing her; she refuses to be a cliché, and even takes over a significant chunk of the book as the author later on. Q: The novel takes place in San Francisco around 2008. Do you think it could have taken place in another city and time period, or only the ones in which it's set? A: I’ve mentioned before that San Francisco is a city of early adopters, and in many ways forecasted the contemporary American city—social networks, smartphones, Uber, gay marriage, tech gentrification, juice cleanses, speculation bubbles. Much of what happens plotwise wouldn’t be out of place in New York today; but culturally, in the boundless sunshiny optimism and yeasaying, it makes more sense to set it in SF. A lot of the satire also targets Silicon Valley and Stanford pretty specifically, though that’s not the book’s main focus or anything. Q: Did you know how the book would end before you started writing, or did you make many changes as you went along? A: I didn’t even write it from beginning to end. I wrote the whole thing practically all at the same time, writing scenes and sentences without the slightest notion of where they’d be going. It was like fitting together a 5,000 piece Jackson Pollock jigsaw with no edge pieces. But I did have some notion of the ending—nothing is very conclusive for a 20-something, but failure is a certainty, so I wanted an ending that united the characters in their various failures at just around the time the economy and the Bush era were also to imminently recede. A: Three nonfiction books: one about rejection, one a collection of fictitious criticism, one about a family visit to Thailand. My next novel, probably the only commercially viable one, is about standup comedy, video games, and the death of identity. All of it considerably weirder than this first book. A: This very broke writer appreciates any and all patronage and promotion.